SHARP ELSIMATE EL-210 LED Calculator + original case + box + Guarantee! SHARP ELSIMATE EL-210 LCD DISPLAY CALCULATOR. GREAT CONDITION, FULLY WORKING, ALL DIGITS CLEARLY READABLE. BATTERIES FITTED FOR TESTING ONLY, ITEM WILL REQUIRE BATTERIES. Hello, I have a pocket slimline Sharp Elsimate solar powered calculator for sale. Believed to have been launched and discontinued in 1980. Still working, see photograph 2, but batteries not included. A collector's item. Boxes and polystyrene peanuts / bubble wrap is usually sourced for free. Looks like new - minimal wear. Solar power and battery operated (twin power calculator). I don't have any instructions for it. Sharp Elsi Mate EL 2135 retro solar powered desk calculator. Condition is Used. Dispatched with Royal Mail 1st Class. Made in Japan on the rear. Sold as seen in vdery good condition and functional. However, this was a donation so we cannot say how much life is left in the batteries. We have one simple, but veryimportant mission : 'To maximize the quality of life. VINTAGE SHARP CALCULATOR ELSI MATE EL-326 SOLAR CELL CALCULATOR, WORKING. 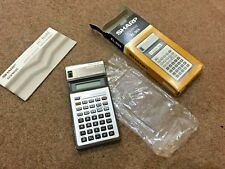 SHARP ELSIMATE EL-208 CALCULATOR - FULL WORKING CONDITION WITH BOX! This is a SHARP EL-208 8 Digit Electronic Calculator - Battery powered. Quite a collectable, and becoming increasingly difficult to find, manufactured in Japan by the SHARP CORPORATION. The calculator remains in good, clean condition - it has been kept within it's original box and the good condition is as a result of this. May make a nice collectors item. NO MANUAL WITH BOX. SHARP ELISIMATE EL-34051 TWIN POWER SOLAR/BATTERY HAND HELD ALL IN A NICE CLEAN CONDITION. Calculator SHARP ELSIMATE EL-8118. This calculator has been tested and is in perfect working order otherwise. This calculator has been tested and is in perfect working order otherwise. Calculator SHARP ELSIMATE EL-8146. This calculator has been tested and is in perfect working order otherwise. Sharp Dual power Elsimate EL-330ER calculator. Boxed with instructions in working order. Double zero key. 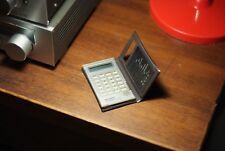 Flip stand to raise calculator. Grand total key. Calculator Type: D/T Sol/Bat/Rec. Battery: Yes. Type: Professional / Desk Display Calculator. Excellent condition, like new. Model Number: 188441. 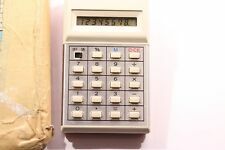 A Sharp Elsimate EL-8158 calculator with original sleeve, instruction manual and box. The calculator is in good clean working condition, the sleeve is split down part of one side and instruction manual is creased but all original. From a smoke and pet free home. Good used condition, fully working order, see photos, free pp UK. Used condition, fully working order, see photos, free pp UK. New listingSHARP EL-371H ELECTRONIC CALCULATOR ELSI MATE X10. SHARP EL-371H ELECTRONIC CALCULATOR ELSI MATE X10.. Condition is New. Model EL-1611H. 12 digit LCD display. Can be powered with batteries (AA) or with a mains adaptor (not included). In perfect working order. The faceplate surrounding the keys has gone a little yellow but there is no deterioration in the plastic and no cracks. ALL SHARP ELSI MATE AND ALL WORKING. EL-376H WITH CASE AND BOX, EL-218 WITH BOX, EL-531H WITH CASE BOX AND INSTRUCTIONS AND EL-230. Your chance to buy this rare Sharp ELSI MATE EL-8116 LED Calculator. Square root function. Powers up and seems to be fully functional. 8 digit LED display (green). A nice looking calculator and a bit of tech history. SHARP ELSI MATE EL-334F tax twin power calculator. In good working order with slight discolouration from age. The calculator has the following features: 10 Digits 4 Key memory Extra large angle LCD Tax function Grand total key (GT) Double zero key Flip stand to raise calculator for desk use. Solar/battery powered: LR44 x2 WxDxH: 105x150x15mm The calculator does not have the instruction manual. From a smoke free home Thank you. SHARP ELSI MATE EL-340 SOLAR CELL POWERED CALCULATOR ALGEBRA 1985 VINTAGE JAPAN Calculator with minor wear and in perfect working order. This comes along with original document and instructions also. The EL-S25 Sharp Quiz Calculator is wonderful for multiplication beginners. It features an easy-to-use flash card function for improved math learning. This twin calculator has a Multiplication Table Quiz Function to enhance the mathematical ability for growing children. Sharp Elsi Mate EL-208 Calculator. there is a slot at the top of the calculator and using a coin edge opens the calculator so that a battery can be inserted. no instructions included. Credit card thin sized and hard to find.